I've recently heard that Bonnie Hunter's Scrappy Bargello are "everywhere" -- It's time for me to make another one - they are fun and excellent scrap user, as well as a charming Linus/kids quilt.. 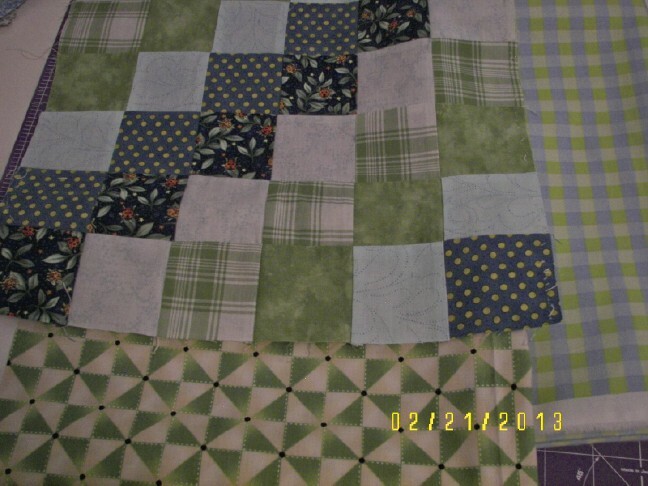 Here is one block - I've made 16, heading for 24, but I ran out of that spring-y green plaid. An order was placed on line for 2 possibilities, and when my order arrived, the blue/green plaid on the right was chosen. It's gonna work! Today I'm getting the rows together. Guess who/what is baaaaaaccccckkkkkk! 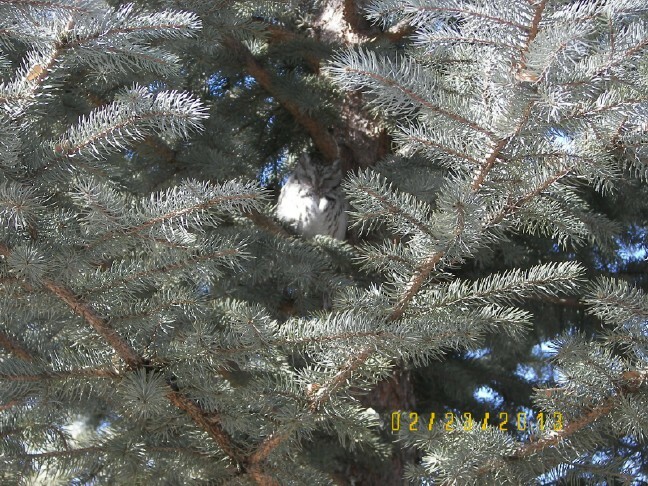 8-)) For months, we've been noticing a pile of poop ( LOL ) under one of the evergreens but could never find the roosting culprit until today. Perhaps this is our pooper! Do you see him? My goodness he's almost invisible this time of year, wearing whitish plumage. He didn't even open his eyes to look at us - such a bold little thing. If you don't remember my stories of his and his family's visit last year, he is a Screech Owl. We still have a bit of snow, temps are mid 40s, but more snow is expected tonight. Stay warm, little Screech Owl! Your scrappy bargello or trip around the world looks like fun! I hope to see some of the other blocks you made already, too. Hedwig is cute! I need to get back to the Scrappy Trips I started last month. You are cruising on yours! 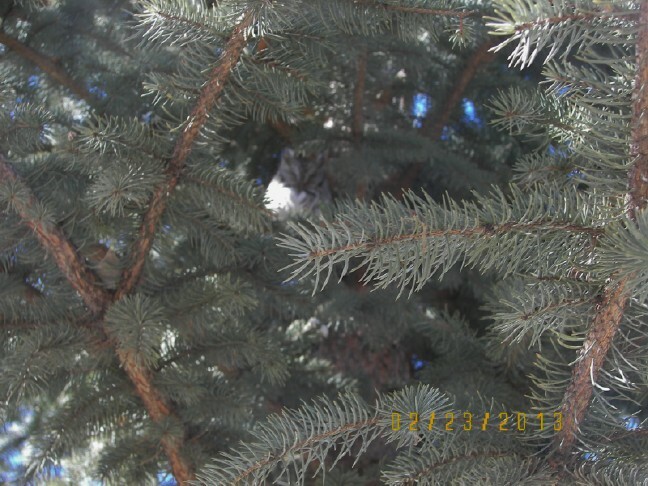 I had to enlarge the photo to see the owl. What a sight! Oh I'm so delighted - welcome back little owl!!! Love the green/whites of your TATW. It took me ages to find the owl - kinda like Where's Wally LOL. I love your name. I love it so much I maned my daughter who just gave birth Elaine. Thanks for visiting my blog.